Sophia (Sophy) Gray designed no fewer than 40 of the 50 Anglican churches built during her husband Robert Gray’s bishopric. She was the first woman to practise architecture in South Africa, and one of the earliest to do so in the world. No mean feat for a woman who was a wife during the Victorian era, and a mother to five children. Perhaps Sophy managed to escape the full impact of the crinoline, and its relegation of women to the home, when she moved with her husband from England after he was assigned the colonial bishopric of the Cape of Good Hope. Part of his remit was to build churches. Robert and Sophy Gray arrived in 1848 to settle on the farm Boschheuvel, originally known as Wijnberg, and later called Bishopscourt. With her Sophy brought drawings and plans of church architecture that she felt would best adapt to South African conditions. She added her own sketches of styles and details that shaped the form of Anglican churches all over South Africa, conferring often with the British ecclesiastical architect W. Butterfield. Remarkably she was totally self-taught, with no training bar her natural ability to paint, and a propensity to observe the rudiments of architecture. 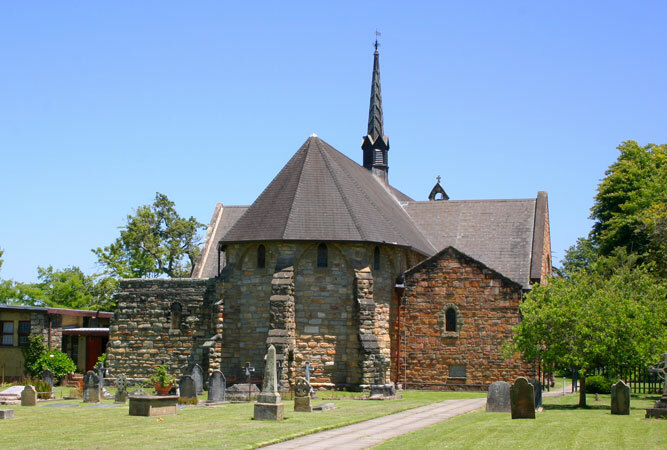 Most of Sophy’s churches are found in the Western and Eastern Cape, but since she was an adept horsewoman and accompanied her husband on many, if not most, of his extended journeys, her churches lie as far afield as Willowmore, Bloemfontein, and even Pietermaritzburg and Umzinto, in KwaZulu-Natal. Today her drawings and detailed diaries are held in the William Cullen Library at Wits, in Johannesburg. Very few of her church designs remain unscathed. Here are just 10, heavily influenced by the neo-Gothic style of architecture. Common to all is their modest scale, and frequent use of local stone. 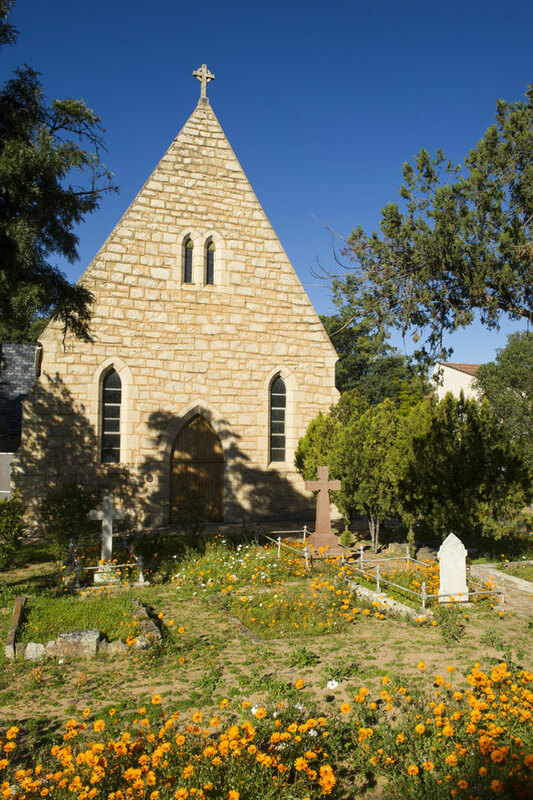 The southernmost tip of Africa, or at least the town that functions as a gateway to Agulhas, Bredasdorp’s historical walk incorporates the beautiful All Saints Anglican Church built somewhere between 1859 and 1863 and designed by Sophy Gray. Find it in All Saints Road. Two of Swellendam’s churches are Sophy Gray’s as Robert Gray visited the town more than once during his time in the Cape. Christ Church, finally consecrated in 1855, was built whilst the Grays were away in England. Upon their return the west side was taken down and rebuilt. But the church was badly built and finally demolished, as a result, in 1910. The little stone church now in its place was built on its foundations. St Luke’s Mission Church, on the other hand, remains standing, built after Sophy’s death. Completed in 1874, it is still in good condition, is considered a building of considerable period character, and serves as a landmark in Swellendam. 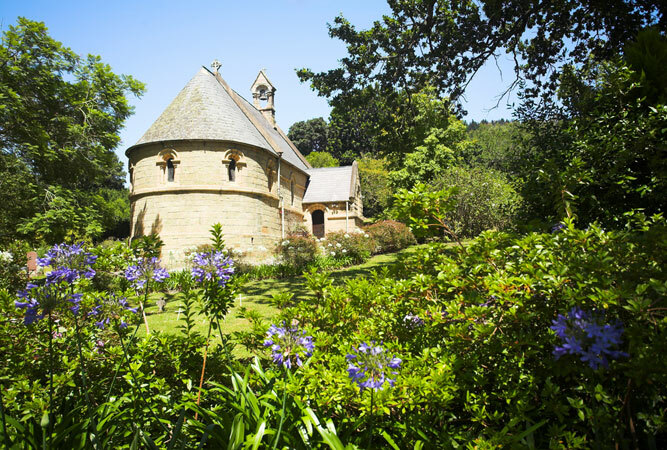 Everyone knows this little church on the west side of Knysna’s lagoon. It is the only of Sophy’s churches in the Norman or Romanesque style, characterised by a round arch, small windows and thick walls. As such, it is one of Sophy’s better known churches, built on land owned by Thomas Duthie, for his wife Caroline (a rather romantic story) – their farm later became Belvidere. This little church is incredibly beautiful. Consecrated in 1855, the church was later declared a heritage site. Lovely stained glass windows and unusual organ pipes retain the Gothic character of the church. Contact the local tourist information for walking tours of the town. St James, in Somerset Street, lies in the centre of Graaff-Reinet. It is the oldest original church building still in use; a magnificent building that is virtually the town’s icon. Built in 1850, the original church would have been just the nave. In 1868 the chancel and sanctuary were added, and the entrance porch in 1874. To visit, use the side or back door (they are often open). You can’t miss St John’s Church on the Main Road in Clanwilliam. This beautiful neo-Gothic stone building with steep slate roof and side gable at the front end is possibly one of the best examples of the work of Sophy Gray, and believed to be the least altered of all her churches. Take a look at the parsonage at the same time, as it is similar to the rectory in Bredasdorp; an unusual plan – square with only a narrow opening to the central courtyard. The front of the house, although it has lost its floors, still has the original ceilings. The oldest sandstone building in the Karoo town (Oudtshoorn claims many sandstone buildings and unique architectural styles due in no small part to two historical ostrich booms), St Jude’s was also the first church built in Oudtshoorn and is said to be the only Anglican church solely dedicated to this particular saint. It is a magnificent building. The adjoining parsonage is also designed by Sophy. Find it on Queen’s Street (Baron van Reede). Sophy’s St Mark’s Church was given cathedral status in 1911 and today functions as the seat of the Bishop of George. Sophy, who visited the church as it was built, laid the foundation stone in October 1849. The stone for the church was mined from a quarry at Victoria Heights, and four stone masons came from Scotland to complete the work. Extensions were made in 1861, a porch was added in 1908, whilst a chancel, vestries, organ loft, side chapel and gallery over the western door, were added in 1925. This national monument lies on the corners of Bowwood and Main Road, the nucleus of which was Sophia Gray’s work – the bell tower, bays for the nave and the porch were added later. This was the Grays’ most local church, funded by the Grays and their friends. The original parish was huge, and included Newlands, part of Kenilworth and a large section of the Cape Flats. Sophy Gray is buried in the graveyard. She died in 1871 (Robert, who died just over a year later, after serving as Bishop of Bristol, was buried at Bristol Cathedral).